46 3/4 by 28 1/2 in. 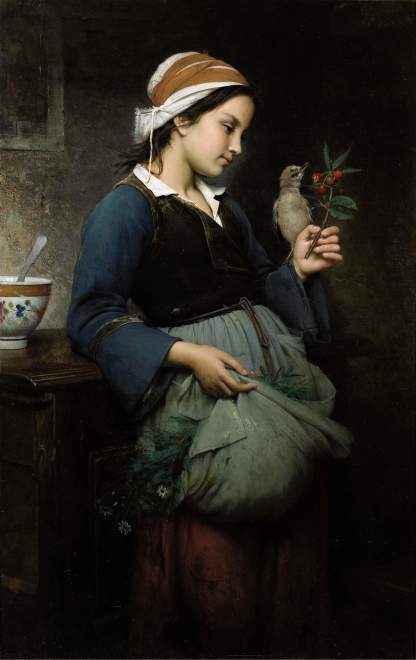 The artist’s well-developed technique evidenced in works like Fillette à l’oiseau is a testament to his training at the École des Beaux-Arts under François Edouard Picot, who also taught William Bouguereau. Very little is known about Emile-Auguste Hublin, an artist from the city of Angers, one of Europe’s most important cultural and intellectual centers in the 15th century. Like many aspiring young artists from the provinces, Hublin was drawn to Paris and enrolled in the École des Beaux Arts in April 1855. He trained under François-Edouard Picot, who could claim both Bouguereau and Cabanel as prior students and success stories. There is no question that Hublin excelled in his Academic training, so clearly evident in the perfection of detail that characterizes our picture. One immediately recalls similar works by Bouguereau, as well as Jules Breton. At the same time, Hublin chose to depict a more realistic, less idealized view of rural life, which suggests the influence of artists such as Courbet and Millet. Hublin was clearly aware of the diversity of the submissions to the long-awaited Exposition Universelle, which opened in May 1855, just one month after his Paris arrival. He also would have seen the forty paintings that Courbet installed in his Pavillon du réalisme. It is accurate to say that Hublin’s art marries the best of the Academic technique, with a more honest, realistic observation of rural (peasant) life. In almost all of his paintings of peasants, Hublin shows mended garments; strips of worn velvet sewn onto rustic muslins. Peasant girls did not wear velvet and one may surmise that these pretty embellishments had their origins in the fancy dresses of the local elite, later to be donated to the village church and repurposed by the peasant class. However, it is important to note that technically Hublin is not drawn to Courbet, but remains true to his teacher, Picot; in other words, mended velvet looks like velvet as opposed to dabs of paint suggesting velvet. Like both Bouguereau and Breton, Hublin was drawn to Brittany, a region whose customs remained exempt from the urban industrialization that was encroaching on the rural population. Most of Hublin’s known works date to the 1870s, and feature young peasant girls from Brittany, identifiable by their white bonnets. Like Millet, who earlier would depict young peasant girls tending their flocks or herding cows, Hublin often portrayed these girls with their farm animals. However, in our charming scene, Hublin chose to show a wild bird tempted by a branch of cherries as he perches on the girl’s hand. Here, Hublin has perfectly captured the moment with a mastery of technical bravura; he even shows the pit in the half eaten cherry. The floral decoration of the Quimper bowl, duplicates the wild flowers in her blue apron. We may never know why Hublin did not become a more well-known artist. He clearly painted in the same style and used subjects similar to those of his contemporaries, William Bouguereau and Jules Breton, both of whom became famous and very successful. One may wonder if Hublin never worked with an important dealer, such as Adolphe Goupil, who could promote his work, especially in America. 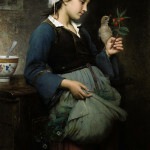 In fact, a review of Edward Strahan’s 1879 Art Treasures of America lists dozens of paintings by both Bouguereau and Breton in the most prominent American collections, yet only one painting by Hublin, Peasant Girls playing with a Rabbit, which belonged to a Mr. W.H. Fosdick of Louisville, Kentucky.